Elsa was better by far than Dally or Lucas… Maybe Eden has inherited those genes from her Great Aunt. 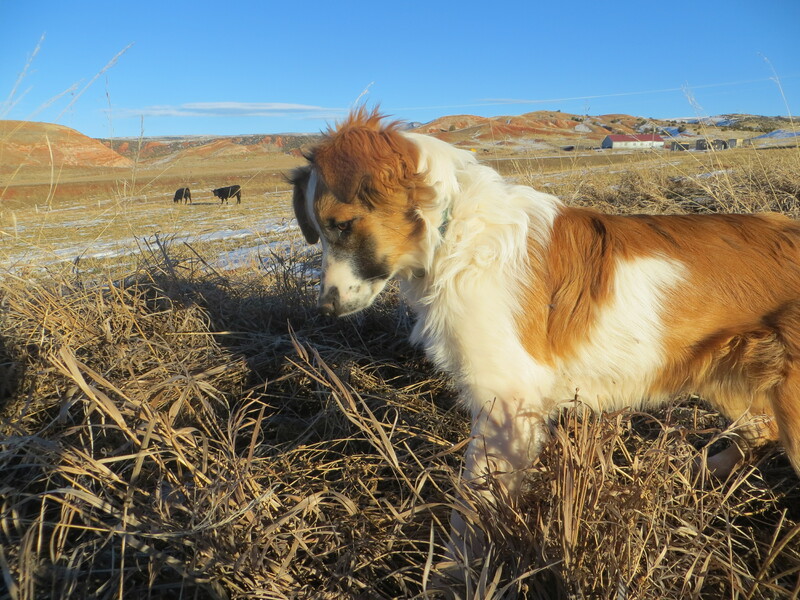 After training on some basic commands in the field (close to some calves for distraction and acclimation), I turned her loose with the “mouse, mouse!” command. I didn’t really think she’d do too much although I’ve seen her digging around… but, man! she was on fire! There was even a few half mastered pounces! She’ll have her work cut out for her if she wants to catch moles on this place… She’ll also be FAT! What an adorable intent little hunter she is… Eden really is a little sweetheart who will give you a lot of joy and a lot of help on your ranch… plus puppies….. I love the way a dog “listens” and “senses” the critter, just before they pounce! Great picture of those characteristics in Eden. Well, well, that explains a lot. Lark is a HUGE mouser. And if she isn’t where there are some to sniff out, she is not above stealing them from the cats. Oh what concentration on Eden’s face. You will have so much fun as you work with and train her. As for those pounces……. Well they’ll keep her warm on your chilly or ‘darn cold’ days. Maybe my hands and feet would be warmer if I tried a few pounces!!! Ha! Ha!